We are finishing up with the judges today with Samuel and he leads us to David. 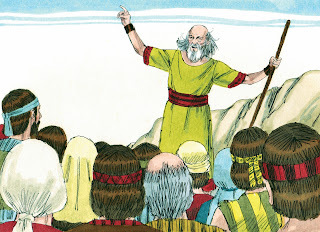 We have a couple of lessons for David and his son Solomon to finish this 13 week quarter of the Old Testament Bible People. We will begin the next quarter with Elijah and Elisha. Today we are going to talk about David. We can find this lesson in the Old testament in 1 Samuel 16 and Psalm 23. What can anyone tell me about David? 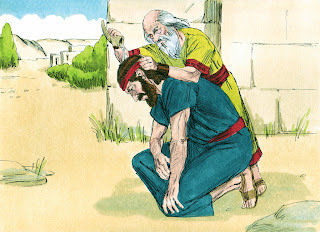 David was a shepherd for his father, Jesse. Shepherds take care of sheep. Shepherds were very careful to protect their sheep from dangers. David had fought a bear and a lion to protect his sheep! Next week we will study David when he fights Goliath! We talked about Samuel last week and he was a judge. But, he has gotten older and his two sons are the judges now. The people start begging Samuel for a king. 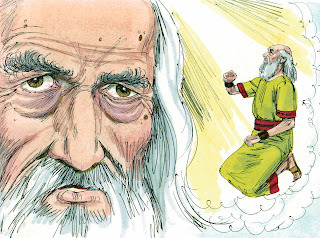 Samuel asks God to tell him what to do. God tells Samuel to remind the people about all the things that would happen and be required of them if they have a king. But, they demand a king. (8:19) They wanted to be like everyone else all around them. There was a man named Saul and he was very handsome. 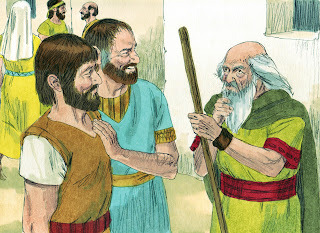 God told Samuel that He would send the chosen man to be king to Samuel. Samuel poured oil on Saul's head to anoint him. When Samuel brought Saul before the people, Saul stood taller than anyone! Samuel told the people that God had chosen Saul to be the king and there wasn't anyone like him! 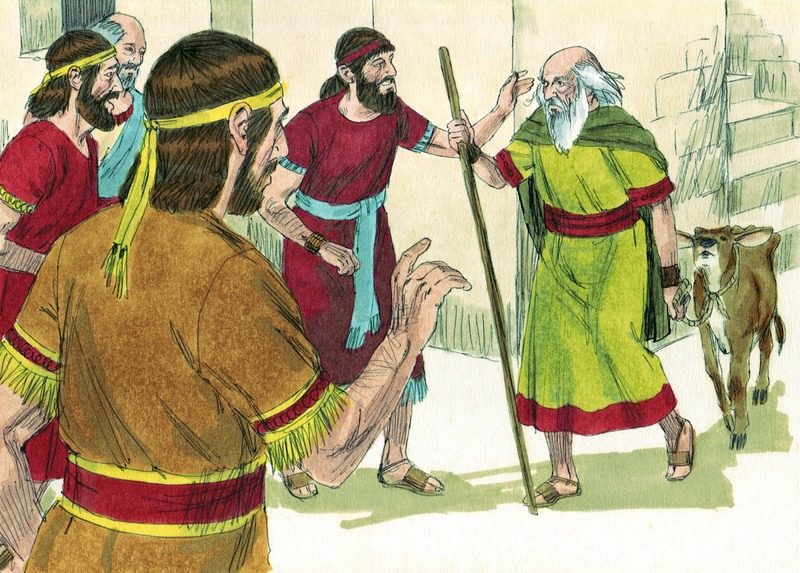 Jesse had 8 sons and 7 of the sons walked past Samuel for him to see. 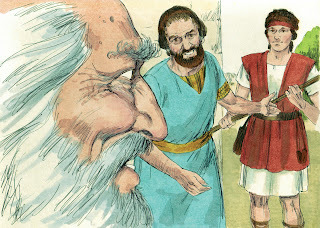 When 7 of the sons were not the chosen one, Samuel asked Jesse "Is this all of your sons?" 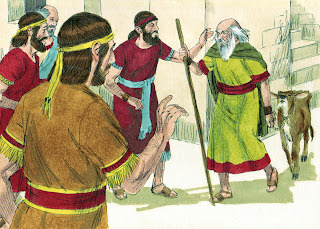 Samuel anointed David with the horn of oil while his brothers were there with them. 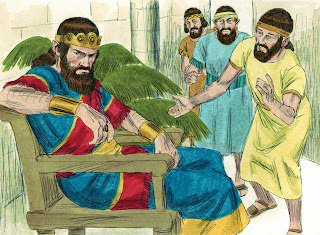 King Saul was feeling depressed, so his servants sent for David. 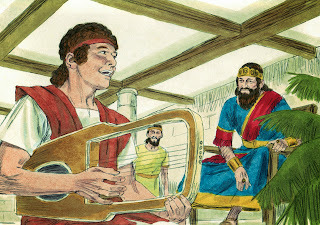 The Bible tells us David could play the harp. David was strong and a good soldier, intelligent and good looking. (16:18) And, God is with him. I originally made this file folder game for this lesson. There are several choices for how to use it. Click on the picture to see the post. I used 12x12 grass scrapbook paper and the kids glue the scripture in order onto the paper. This is the visual I set up for this lesson. David is off to the side protecting his sheep from the lion and the bear. I also use the sheep, rocks and bushes for The Parable of the Lost Sheep. Click here to download today's worksheet. Click here to see the worksheets for this quarter. Click on the above picture to download today's Bible verse. You can also see the updated David letters and Flap Book here. I love the stories of David. 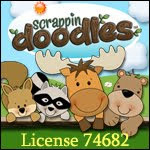 Thanks for sharing these great resources for passing these on to the little ones. Thank you Shannon for stopping by! I appreciate the nice comment. I agree, you can really make it fun teaching David. 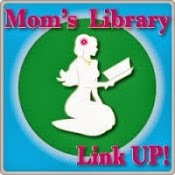 I so appreciate you sharing each week at Mom's Library! 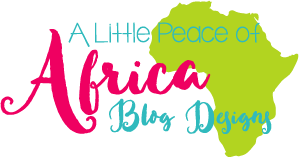 I've featured this post today as well! 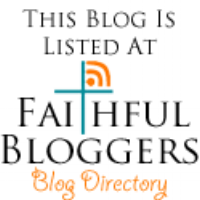 Thanks so much for featuring the post! Thanks again for hosting each week! It is appreciated! What is a File Folder Game? Satan's Target Bulletin Board and More!